It’s been a little quiet here at The Violent World of Parker blog of late, at least half of the blame for which rests with me: I am, after all, supposed to be (esteemed) co-blogger over here. Fortunately I have a small pile of Westlake Scores waiting to be blogged about, at the top of which is A New York Dance by Donald E. Westlake, published in hardback in the UK by Hodder & Stoughton in 1979 under a dust jacket illustrated by Mark Wilkinson, who I believe is this Mark Wilkinson, best known for his Marillion record sleeves. As such, his wrapper for A New York Dance must represent a fairly early piece of professional work. with its Joel Schick-designed dust jacket (which, for the bibliophiles among us, was trimmed too short on the first edition, meaning that the grey boards can be seen top and bottom), stating that I didn’t think it had ever been published in the UK. It was only much later that I realised Hodder had retitled the novel for the British market, something the publisher already had form with with Westlake’s work: witness their paperback division’s retitling of his Parker novels The Man with the Getaway Face, The Score and The Handle as, respectively, The Steel Hit, Killtown and Run Lethal. Mind you, Westlake wasn’t the only American mystery writer to have his work retitled by Hodder; his near-contemporary, Ross Thomas, had a couple of his novels retitled by the British publisher – his debut, The Cold War Swap, which became Spy in the Vodka (for a short while, anyway), and one of his pseudonymous Oliver Bleeck books, The Procane Chronicle, which became The Thief Who Painted Sunlight. 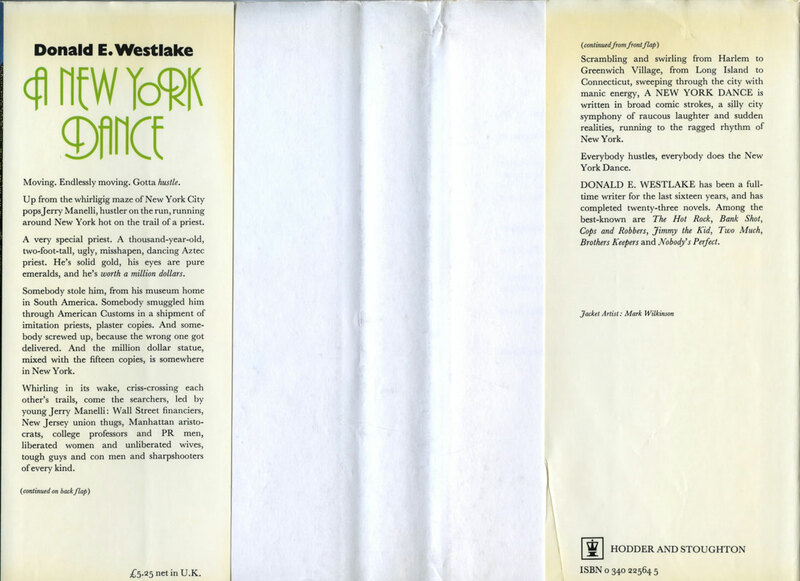 And much later in Westlake’s career another British publisher, Robert Hale, did some titular tinkering: The Hook became The Corkscrew, and The Ax gained an ‘e’. e) all of the above, plus I’m demented. Follow your passion! With DEW it’s enough fun just to determine and find all his pseudonyms….you’ve taken it to the next level! Congrats on your finds and kudos to your expanding collection. If you are so inclined, please write me into your will as recipient of your bounty! Thanks for the share! That “A New York Dance” cover = horrifying.